Strasbourg, Wednesday 15th February – the EU-Canada trade deal ratified by the European Parliament today is a step backward for tackling some of the world’s biggest crises and will do nothing to improve the lives of the majority of citizens in either region, according to organisations representing civil society, workers and the environment. Organisations representing civil society, workers and the environment are now calling on national parliaments to block the deal and the European Union to bring forward urgent proposals for an equitable, social and ecological trade regime. This is needed more than ever, according to the organisations, as a failing model of globalisation that fuels inequality and climate change creates widespread discontent which right-wing populists are trying to exploit the for their own gains. 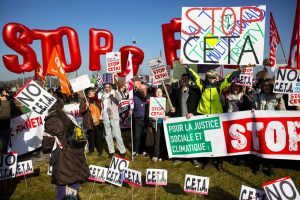 The Comprehensive and Economic Trade Agreement (CETA) affords foreign investors with far-reaching, highly enforceable rights, that allow them to claims hundreds of millions from governments if they introduce social, health or environmental measures that affect companies’ profits. While Investors get VIP rights citizens, consumers and workers are left in the cold with weak and unenforceable commitments on labour, consumer and environmental issues. Following today’s vote, the Comprehensive and Economic Trade Agreement (CETA) needs to be ratified by 38 national and regional parliaments.